WYTHEVILLE, Va. — Residents of a small Virginia town are expressing concern after officials recently removed a plaque from an elementary school cafeteria that thanks God for the food in light of a complaint from one of the nation’s most active Church-State separation groups. “We have allowed the Freedom From Religion Foundation supposedly acting on behalf of some unnamed individual to shake down the citizens of the commonwealth of Virginia, specifically the residents of Wythe County. This decision should be made by us, no ideological bullies from five states away,” J. Andrew Davis, pastor of Fellowship Baptist Church, said during a meeting of the Wythe County School Board on Thursday. The Wisconsin-based Freedom From Religion Foundation (FFRF) wrote to the superintendent of Wythe County Public Schools earlier this year after being contacted by a local complainant, whose identity it kept anonymous. FFRF asserted that the plaque was problematic because the prayer could conflict with the beliefs of some students and their families. The professing atheist group also contended that the plaque was unconstitutional because it gave the impression that the school prefers Christianity over other religions—or no religion at all. 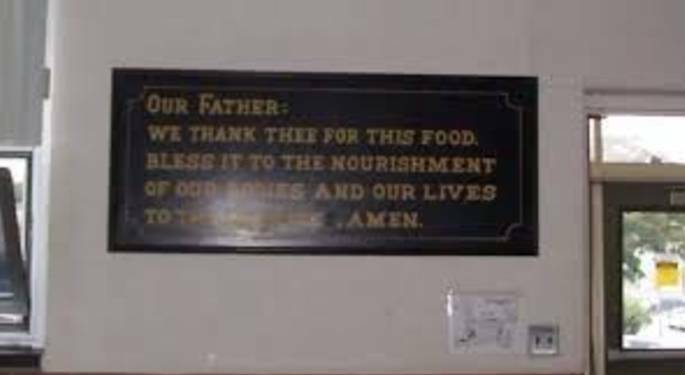 It requested that the plaque be immediately removed from the cafeteria, and that FFRF be notified of the action that would be taken. While months passed with no response from the district, on Aug. 24, Superintendent Jeff Perry replied to FFRF, advising that the display had been removed. “Now, we are in a whirlwind across the country to just get rid of things we don’t like,” she said, according to Southwestern Virginia Today. The board plans to hold a special meeting on Sept. 21 to explain its actions and listen to feedback from the community. “During this meeting, we will provide community members with an explanation of the law and why we made the decision to take down the plaque,” it notes in a post on its Facebook page. “We will also give community members an opportunity to express their concerns and to ask questions. We are holding this forum to ensure community members have an opportunity to talk with us and to ask questions.